The distributor told me they will not be printing these again. This blanket is longer than it is wide. Great child bed size, or an adult throw blanket! 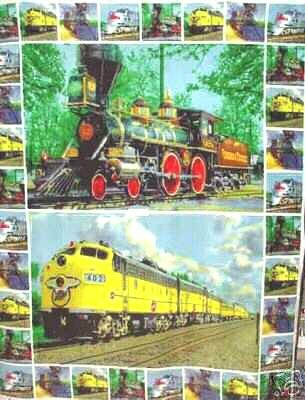 Beautiful locomotives = one new style, and one vintage style. Blocks of trains in the border. Shop early for holiday gift giving. Great gift for the train lover. My blankets are made of single thickness, very soft fleece. The picture is on both sides. They are lightweight and warm. They are machine wash and dry.